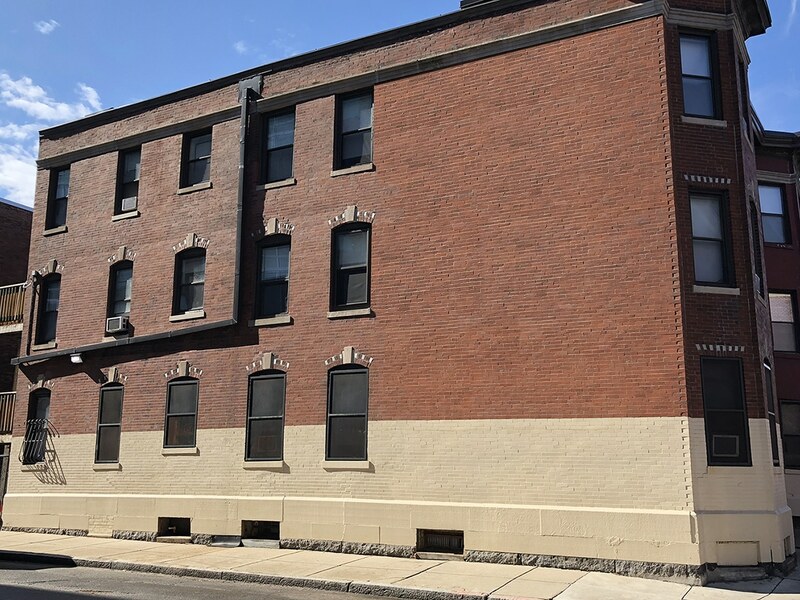 In this issue of Masonry Solutions, our Case Study article describes Phase 1 of a Fast Track masonry repair project involving multiple residential apartment buildings in Boston's Fenway area. In our Masonry 101 article, we describe how a flame retardant scaffold sheeting enables cold weather masonry work. Phase 2 will be described in our next issue. In this issue of Masonry Solutions, our Case Study article describes our maintenance project at a 3-story college dormitory building owned by Wentworth Institute of Technology in Boston, MA. In our Masonry 101 article, we describe the process of "shoring" to temporarily support a building during renovation. In this issue of Masonry Solutions, our Case Study article describes our rebuilding of a double wythe brick wall at a 4-story commercial building in Boston's historic South End District. In our Masonry 101 article, we describe "scaffolding" and what makes up its components. In this issue, our Case Study article describes total exterior restoration of a 4-story brick and stone townhouse-type apartment building owned by the Pine Street Inn in Boston's Historic South End District. Notably, the project was "fast tracked" to beat the cold winter weather. In our Masonry 101 article, we describe what cladding is. In this issue, our Case Study article describes the completion of masonry restoration project at a distinguished English Tudor style home in Newton, MA by Abbot's Small Projects Division. In our Masonry 101 article, we describe what a "turret" is and its derivation. In this issue, our Case Study article describes Abbot's recent completion of a multi-phase restoration project of a luxury high rise brick condominium building in Medford, MA. By executing the project in phases, the owner was able to optimize cash flow over the entire timeline of the project. In our Masonry 101 article, we describe Vertical Expansion Joints and their function in maintaining the integrity of a brick structure. In this issue, our Case Study article describes Abbot's recent completion of a multi-phase restoration project of a 4-story brick and concrete building for a local condominium association. By executing the project in phases, the owner can optimize cash flow over the entire timeline of the project. In our Masonry 101 article, we describe what a "light well" is and its attributes. In this issue, our Case Study article describes Abbot's recent restoration of the facade and windows of a large one-story commercial building at 2000 Washington Street in Boston's Roxbury section. It is once again significant to note that Abbot was contracted by an owner based on successful work at the same property in the past. The project is also being done in two phases to optimize cash flow for the owner. In our Masonry 101 article, we describe how concrete "sound testing" is accomplished. In this issue, our Case Study article describes Abbot's recent restoration of a 5-story brownstone condominium building at 33 Chestnut Street in Boston's historic Beacon Hill district. It is significant to note that Abbot was contracted once again by an owner based on successful work at the same property in the past. In our Masonry 101 article, we describe what a mansard is and trace its roots. In this issue, our Case Study article describes Abbot's recent restoration of a series of five pre-cast concrete portico entrances to the condominiums at 57-65 Babcock Street in Brighton, MA. In our Masonry 101 article, we describe what a portico is and trace its roots.